Premenopause symptoms are, in general, the ones that women experience during their menstrual cycles. With different degrees and frequency, most women experience symptoms known collectively as premenstrual syndrome (PMS). The following sections will explain the many manifestations of PMS, including both the common and uncommon symptoms. 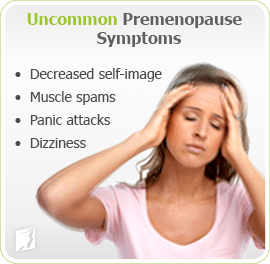 Read on to learn about the symptoms of premenopause. 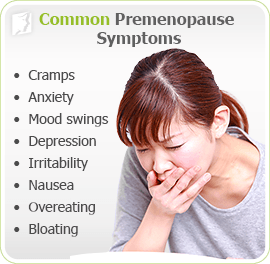 For most women, premenopause symptoms are a monthly matter, since such bodily discomforts appear alongside women's menstrual periods. Their frequency and intensity, however, might vary. That is why it is important for women to be in-tune with their body's typical functions, since any change could indicate a serious underlying health issue. Read on to learn about the common and uncommon symptoms of premenopause. Cramps. Right before or during their menstrual periods, some women report having mild to severe cramps. Anxiety. This is one of the most common problems among women in their reproductive years. It could be stress-related, but estrogen imbalance has also been found to be a cause of this symptom. Mood swings. Sudden changes in a woman's disposition are common around her period. Depression. Also linked to estrogen imbalance, women are more likely to experience depression than men. Irritability. Women tend to get angry easily around their menstrual periods due to hormonal changes. Nausea. Before their menstrual period, some women feel nauseous as a result of irregular hormone levels in their bodies. Overeating. Some women feel carbohydrate cravings that consequently lead to overeating during their menstrual periods. Bloating. Women's bodies retain more fluids during their menstrual cycles due to an increase in progesterone levels. Muscle spasms. Some women report having leg cramps or muscle tension right around their menstrual periods. Decreased self-image. In some situations, self-deprecation is related to irregular hormone levels. Panic attacks. Severe anxiety leads to panic attacks. Dizziness. Feelings of vertigo and an inability to maintain balance may be connected to the menstrual cycle. While many women don't need much to alleviate premenopause symptoms, others find that their symptoms are severe enough to require treatment. Fortunately, there are several ways women can help themselves find calm and relief during the menstrual cycles. Please read on to the next section to learn more about treatments for premenopause.